It's 02:58 in Ghemme, Italy right now. Traffic A26 - KM 143,0 - Romagnano itinere nord A view of the current traffic situation. 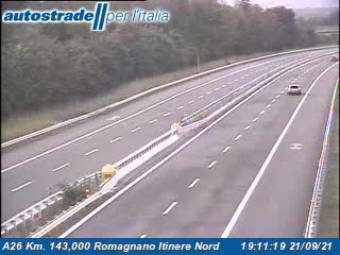 Ghemme: Traffic A26 - KM 146,6 - Romagnano itinere sud, 0 miles away. Borgomanero: Traffic A26 - KM 151,1 - Borgomanero itinere nord, 7.3 miles away. Borgomanero: Traffic A26 - KM 157,9 - A26/D8 itinere nord, 7.3 miles away. Gattico: Traffic A26 - KM 163,8 - Arona itinere nord, 9.2 miles away. Biandrate: Traffic A26 - KM 127,7 - A26/A4 itinere nord, 10 miles away. Campagnola: Traffic D08 - KM 20,3 - D 08 - itinere Ovest, 10.9 miles away. Paruzzaro: Traffic A26 - KM 166,4 - Arona itinere sud, 11.6 miles away. Arona (Lake Maggiore): Arona and Lake Maggiore, 13 miles away.